Railroads being profit-motivated entities have a desire and vested interest in having safe railroad-highway grade crossings without any cost to them. As a result, for several years, the railroads as defendants have presented two long-standing arguments in court cases involving their liability in railroad-highway grade crossing accidents. The first of these arguments is that the driver has the sole responsibility for safety at railroad-highway grade crossings. And, the second of these is the pre-emption argument, where the railroads have had some noteworthy success with recent U.S. Supreme Court rulings. The pre-emption argument states that because the federal government provides funds for safety improvements at grade crossings (primarily active traffic controls), this funding action pre-empts the railroad's common law responsibility for grade crossing safety. Although, I don't agree with this hopeful abdication, I do understand the railroad industry's reasons for trying. A more useful endeavor, surely, would be to more thoroughly explore a joint public-private cooperation, recommended by the 1988 Manual on Uniform Traffic Control Devices (MUTCD), Part 8A-11, in supplying safe grade crossings at reasonable cost to both. Arguments by railroad defense interests present a very narrow definition of extra-hazardous railroad-highway grade crossings. These arguements strictly interpret the Uniform Motor Vehicle Code (UMVC)2 to say that most all of the responsibility for the safety at railroad-highway grade crossings rests with the motor-vehicle drivers using the roadway. Secondarily, they add some additional unspecified responsibility for highway agencies but no responsibility whatsoever for the railroads. This interpretation is not only unrealistic and is not only contrary to common law requirements for railroads, but also is contrary to the limitations of human behavior. To put the majority of the burden on drivers for the safe operation at highly sight-restricted, poorly-designed grade crossings is to promote rather than to remedy extra-hazardous conditions. My rebuttal presented here, in contrast to these defense arguements, analyzes the definition of extra-hazardous not only with less rigid constraint but also from a safety-advocate perspective. 11-801 - Basic rule. No person shall drive a vehicle at a speed greater than is reasonable and prudent under the conditions, including actual and potential hazards then existing. Consistent with the foregoing, every person shall drive at a safe and appropriate speed when approaching and crossing an intersection or railroad grade crossing, when approaching and going around a curve, when approaching the crest of a hill, when traveling upon any narrow or winding roadway, and when special hazards exist with respect to pedestrians or other traffic or by reason of weather or highway conditions. The railroad defense interpretations of these provisions applied to highly sight-restricted grade crossings are: (1) that the sight distance should tell each driver what is the safe approach speed rather than having the roadway operating speed being used to design a safe sight triangle; and (2) that where the approach sight distance is restricted, all drivers should be required to stop. Because these options are not totally consistent with the UMVC or with common law and are both unrealistic and unsafe at grade crossings with crossbucks only, the only logical alternative to providing safe sight triangles in this line of reasoning is to place stop signs at every one of these crossings. In attempting to set boundaries on their definition, the railroads say a grade crossing with signal lights and gates cannot be extra-hazardous. Most experts would tend to agree with this boundary with exceptions made for situations such as malfunctioning signals, poorly-aimed signals, sight-restricted signals, signals too close to a parallel roadway, etc. A next step in this defense reasoning is to say that crossings with signals only (no gates) also cannot be extra-hazardous. Most experts again would generally agree but with exceptions made as noted above and for other conditions such as multi-tracked high-volume crossings where a clearing train can hide an opposite-direction train. The American Association of State Highway and Transportation Officials (AASHTO)3 and the American Railroad Engineering Association (AREA)4 both agree about the safe limits of approach grades, and AASHTO3 and the Federal Highway Administration5,6 both agree on recommended minimum safe sight triangles. Slight deviations from these standards probably do not define an extra-hazardous grade crossing. But, a vast number of passive grade crossings in this country cannot satisfy 50% of the recommended sight distances, and many have less than 25%. Is a grade crossing extra-hazardous when it has less than 50% of the recommended approach sight distance? I would say that the answer is a definite YES. 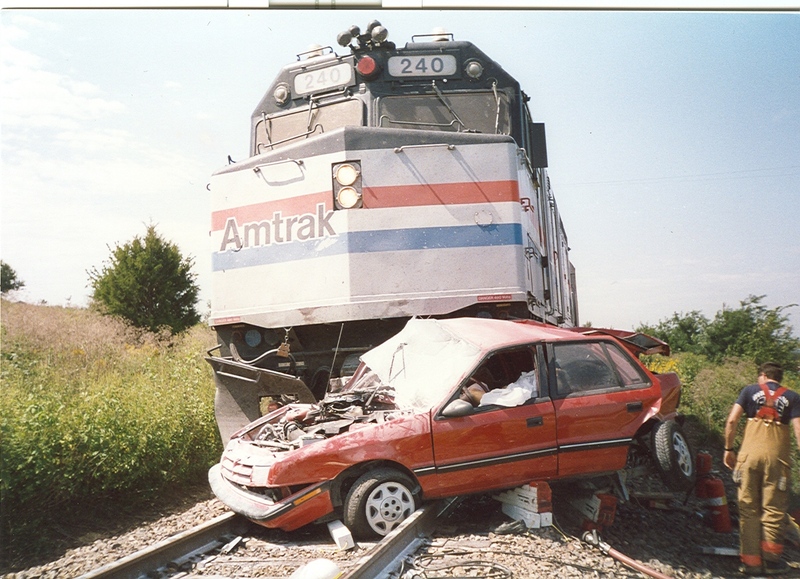 Passive grade crossings with both high-speed trains and high-speed motor vehicles by their very nature are hazardous because one of the two potentially conflicting vehicles is operating on a fixed rail with little or no ability for accident avoidance. At crossings with no more positive guidance than a crossbuck marker, the entire burden is placed on the motor-vehicle driver to: (1) perceive any conflicts while scanning both track approaches and the roadway ahead; (2) judge the speed of closure of both the train and his own vehicle to the crossing, and (3) decide on the safest course to either attempt a stop or proceed across the crossing. This task becomes extra-hazardous when the available sight distance is so restricted that the driver is able to pass beyond the point that defines his safe stopping distance to the grade crossing without being able to see a nearby train. Successful performance at the guidance level requires selection of a speed and path to negotiate a hazardous location safely and efficiently. Hazards are objects, conditions, or situations, which produce accidents when the driver fails to perform successfully. Object hazards are of two types, fixed and moving. Of the two, fixed objects are generally easier for the driver to assess as hazardous and to avoid. The condition of the highway, its design features, and its state of maintenance all may contribute to a highway condition hazard. Also included are geometric characteristics such as lane drops, tangential off-ramps, inadequate superelevation, etc. This type of hazard is generally more difficult to recognize and more complex to deal with. The most complex and difficult hazards to recognize and deal with are situation hazards. These are essentially combinations of conditions with or without object hazards. Often, a situation hazard may consist of elements which are not themselves, hazardous, but when combined (e.g., inadequate superelevation, rain, bald tires) lead to accidents. As hazards become more difficult to recognize and more complex to deal with, more driver mental processing time is required and the likelihood for error increases. Positive guidance must aid the driver in these instances. It must help the driver see a hazard that cannot otherwise be seen; it must help the driver identify a hazard when identification is difficult or subject to error; and it must help the driver avoid a hazard if selection of appropriate speed and path is difficult, time consuming, or open to error. The extent and nature of positive guidance is dependent on the hazard and its interaction with the driver's information processing characteristics. Application of positive guidance, therefore, requires an appreciation of the process by which drivers handle information and two of the mechanisms that help them organize and process it: primacy and expectancy. At a hazardous location, several hazards may be close to each other. Information associated with these essentially competing hazards, as well as other information associated with guidance and navigational tasks may compete for the driver's attention. Drivers can attend to only one thing at a time. In situations where information competes, drivers may not be able to select the most important information source for themselves. Attending to less important information could result in a system failure. Positive guidance emphasizes the most important information. When hazards compete for the driver's attention, the criteria for severity and closeness are applied to assess primacy in terms of the results of nonreceipt of competing information. Expectancy relates to the readiness of the driver to respond to events, situations, or information. Based on the driver's experience, when expectancies are met, performance tends to be error free. When expectancies are violated, longer response time and driver errors are the usual result. Positive guidance is responsive to expectancies. It restructures them when they are violated, and reinforces them when they are proper. Information handling that leads to successful performance depends on the driver's ability to detect a hazard, recognize it as such, decide on a appropriate speed and path, and act on the speed and path decision. Positive guidance requires the driver be given all the information needed to make the correct decision. Detecting a hazard depends on how visible, conspicuous, and important it is, as well as the number of competing information sources. It also depends on the driver's expectancies, his visual acuity, and prior knowledge. How recognizable a hazard is depends on visibility factors and the driver's prior knowledge and experience. Positive guidance can enhance detectability and recognizability when either or both are difficult for the driver. Selection of appropriate speed and path is a three-part process of identifying alternative courses of action, evaluating the probability of success of each alternative, and then selecting the most appropriate alternative. Many factors enter into this process and some factors lead the driver to select an inappropriate alternative. These include insufficient time to choose among alternatives, inability to identify adequate alternatives or choose among equally attractive or unattractive alternatives, and insufficient information to make the right choice. Positive guidance can, through suitable traffic control devices, be used to advise or regulate speed and path selections. 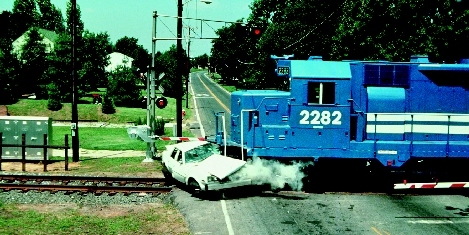 In summary, using the UMVC to argue that drivers assume all of the resposibility for safety at railroad-highway gade crossings is a veiled attempt to discredit the application of the FHWA/AASHTO3,5,6 recommendations for safe approach sight triangles at railroad-highway grade crossings as benchmarks for judging whether a crossing is extra-hazardous. These sight triangle recommendations, based on sound engineering principles, recognize that drivers are not perfect and have limitations in detecting oncoming trains when those trains cannot be seen until the driver is too close to the crossing to avoid collision. These recommendations should be used as benchmarks for deciding on remedial measures at sight-restricted passively-controlled crossings such as cutting brush, removing other obstacles, and/or providing more positive guidance to the driver. To suggest inaction as an alternative cannot ever serve in the interest of safety at railroad-highway grade crossings. 1. Federal Highway Administration, Manual on Uniform Traffic Control Devices, 1988, 2001, 2003. 2. National Committee on Uniform Traffic Laws and Ordinances, Uniform Motor Vehicle Code, 2000. 3. American Association of State Highway and Transportation Officials, A Policy on Geometric Design of Streets and Highways, 1984, 1990, 1994, 2001. 4. American Railroad Engineering Association, Manual for Railway Engineering,1990. 5. Federal Highway Administration, Railroad-Highway Grade Crossing Handbook,1986. 6. Federal Highway Administration, Traffic Control Devices Handbook, 1983. 7. Alexander, Gerson J. and Harold Lunenfeld, Positive Guidance in Traffic Control, Federal Highway Administration, 1975. 8. Glennon,John C., Roadway Safety and Tort Liability, Lawyers and Judges Publishing Co.,2004. 10. Glennon, John C. and James R.Loumiet, Low-Cost Safety Improvements at Railroad-Highway Crossings, Proceeding of the 1992 International Symposium on Railroad-Highway Grade Crossing Research and Safety,1992.